Before HGTV fame, Chip and Joanna Gaines were an ordinary couple living in Waco, Texas who owned a small business. They found the most run-down homes in their community and brought new life to them from the inside out. While Chip and his crew go to work, bringing the house’s structure up to par, his wife Joanna brings her eye for design to create beautiful interiors that truly feel like home. Fans of their popular show Fixer Upper have admired their work for years. But have you seen the interior of the couple’s own home on their farm in Texas? Take a look! Chip and Joanna’s story is truly one for the books. Everyone dreams of meeting someone who compliments them as well as this loving couple does. The couple met in Waco, Texas, in 2001. Chip was working odd jobs as a local entrepreneur of sorts, while Joanna helped her father’s local tire business by appearing in their commercials and ads. Chip came into Joanna’s father’s shop and although they had no idea what the future had in store for them, the two hit it off. Just two years later, they knew it was meant to be, and they tied the knot in 2003. Everything changed when Joanna became pregnant, as we’ll see next. Typically when a couple is first married, they don’t have a lot to start out with. Chip and Joanna were no different. Chip had begun to take an interest in purchasing and updating homes and apartment buildings around the local college, and his newlywed wife was fully supportive. However, this meant that they often lived in homes that needed a lot of work (nine of them!). And once they were updated, the couple would move out, sell the house, and start over. Things changed when Joanna became pregnant with their first child, and the couple agreed that they needed to find a home to settle into to raise their family. They didn’t purchase their dream home until 2012. That’s when they found a farmhouse they fell in love with. It wasn’t perfect- in fact, it only had two bedrooms. And with their growing family (the couple now has five children) they knew it would require a lot of vision and hard work to make the farmhouse work for them. Although they were busy flipping homes with their business Magnolia Homes, the couple was ready to make the commitment and turn their own fixer-upper into their dream home. Coming into it, it was clear that the home needed a lot of work in order to be able to suit the Gaines family of six, at the time. The farmhouse consisted of two bedrooms and an unfinished attic. The couple only planned on adding on one room, the master bedroom. Otherwise, the design consisted of opening up the space. Understandably, many families would opt to add square footage to the space to fit a family of six, but Chip and Joanna wanted to keep the farmhouse a cozy space where the family would also be gathered together. The property had plenty of oak trees that the couple admired, “If these oak trees could talk I would love to hear their stories!” Joanna exclaimed. She also sought to preserve the character of the exterior of the home, salvaging the existing trim and molding. As for the color palate, Joanna selected a range of soft colors. “I chose whites and soft neutral tones in the farmhouse so that it would be a calm place for the family when life gets full.” The brick chimneys and steps, and wooden beams balanced out the white, adding warmth and texture to the exterior design. With plenty of kids running around the house, Joanna made sure that the front entry was well-equipped for all of their coats and belongings, as most kids dump everything at the front door. She selected a rustic coat hanger and centered a frame above it with an inspiring quote for the family to remember as the enter and leave the farmhouse. And of course, the entryway includes plenty of Joanna’s favorite material to work with… shiplap! See the stunning farmhouse kitchen, next. Somehow, the kitchen always seems to become the heart of the home. Knowing this, Joanna selected the perfect island to center the space. She found the island at a local antique store and discovered that it was initially a Romanesque cabinet from an old Waco church. She told HGTV Magazine that before making her final decision, “I probably stalked that thing for two years.” Joanna then painted it white and topped it off with a concrete countertop that’s both classic and durable. Situated next to the kitchen are the Gaines’ dining and living space. 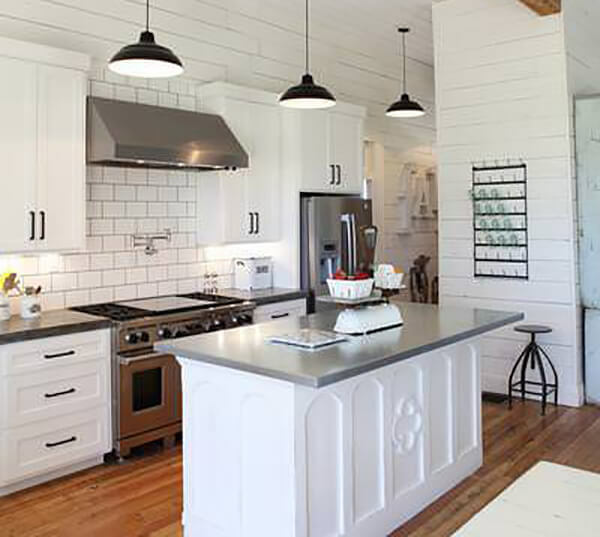 The floor-to-ceiling white shiplap gives the space an open and calm feel. It’s complemented with rustic antique finds that Joanna refurbished and purposefully placed around the living space. The dining table is simple but big enough to fix the whole family. From this angle you can see that the couple really did maintain the original square footage of the simple farmhouse, focusing on utilizing the space rather than expanding it. 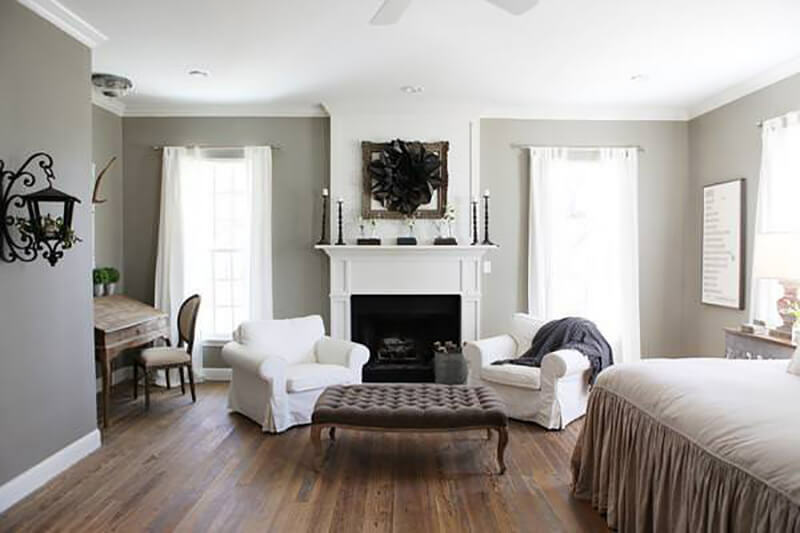 When watching Fixer Upper, many viewers have had the realization of, where’s the TV?? Joanna has a reputation for not including televisions in the living room designs of their fixer-uppers, and their own home is no different. In fact, that’s why they wanted to move to the farm in the first place. One of Joanna’s favorite things to do is explore antique shops. Often times she’ll invite her husband Chip along too, and they’ll find unique pieces to hold onto until they find its perfect purpose. Antiques are found throughout their home, including lamps, bottles, window shutters, and antique books. It gives the home a warm, authentic feel while balancing out the modern elements of the interior. The pieces are also one-of-a-kind and each comes with its own story. The only addition to their home, originally built in 1895, was the master bedroom. In order to tie it into the original design of the rest of the house, the couple pulled materials from the attic and reinstalled them in the home’s addition. Also in the master bedroom of the farmhouse is a cozy space for the couple to take a breather. Now with five young children in the home, this is the one designated space for the couple to have to themselves. Joanna designed it with a classic white fireplace, framed by two large windows. There’s also two sofa chairs with an ottoman. Like the rest of the home, the color palate is filled with calming neutral colors. The attic’s floorboards the couple moved into the bedroom tie it into the rest of the home and add natural warmth to the room. Adding soft candles and neutral colors to their bedroom balances out the grey walls. 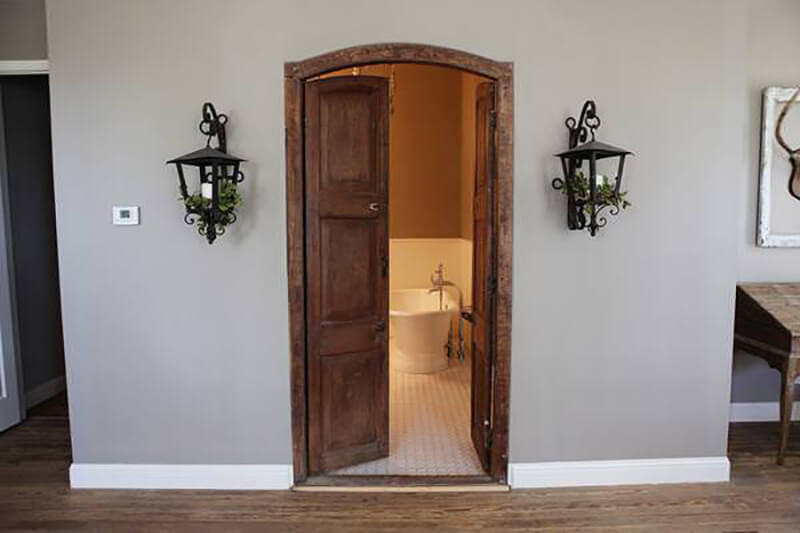 This beautiful antique door leads into the master bathroom. The couple found the perfect free-standing bathtub to tie in the classic farmhouse theme of the home, along with a romantic hanging chandelier. Joanna carried the light and romantic design into the master bathroom. Also part of the addition of the home, you wouldn’t be able to tell with the vintage features that Joanna brought into it. 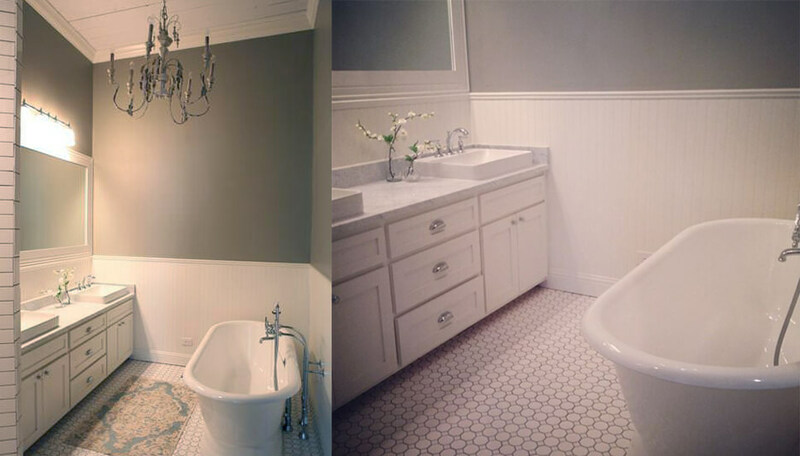 The white tiled floor and classic freestanding tub are complimented by the antique chandelier. Joanna couldn’t help but add some shiplap into this space. The designer opted for her favorite wide boards on the ceiling and a thinner design for the wall paneling. With the addition of the master bedroom, the farmhouse now had three bedrooms in total. That meant the two girls would share a room, and the two boys would have another. The Gaines’ daughters’ bedroom features a neutral gray toned wall with thin shiplap flooring. The overall design is simple, with a shade of white carried throughout. A picturesque doll house and antique white chandelier are a reminder of the house’s history, while also being something fun for the girls. Take a look at the boys’ room, next. At the time of the design of the boys’ room, Chip and Joanna didn’t know for sure they would be having another boy- they weren’t even expecting! But as fate would have it, the boys’ room is perfectly outfitted with bunk beds to fit them all, once their youngest is old enough for his own bed. One of Joanna’s favorite things to do in kids’ room designs is to add unexpected elements for a fun surprise. In her sons’ rooms, Joanna included cute awnings over the two windows and mounted a ladder on the wall for fun. A map on the wall ties into the theme of adventure. 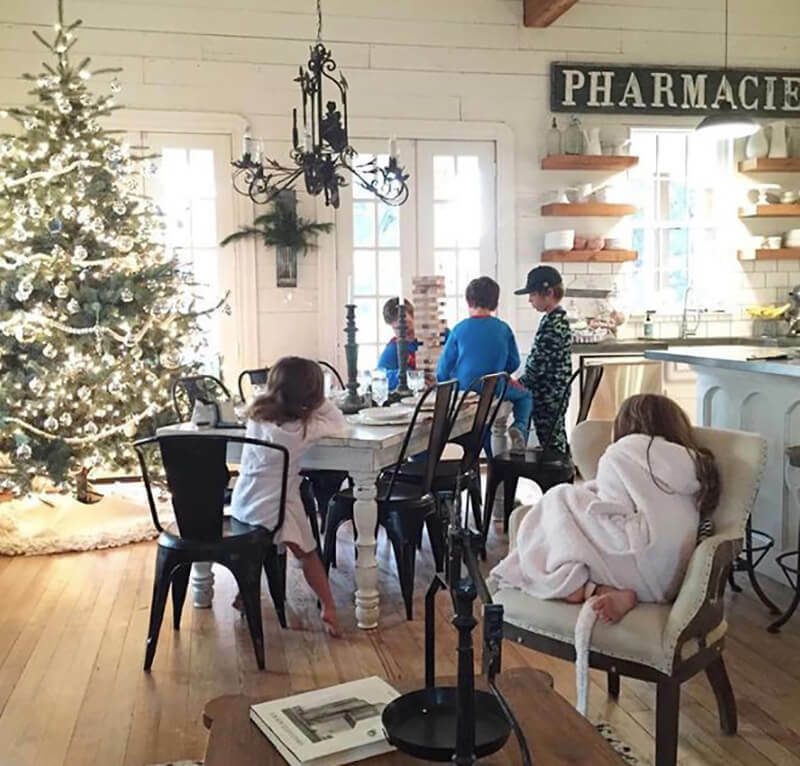 You’ll see their flooring is similar to the wood taken from the attic in the home, and shiplap on the walls in a gray tone ties the boys’ room into the rest of the farmhouse. The Gaines could have afforded a bigger house, but their vision was a cozy home on a farm where the family could grow up close together. Walking up the staircase to the kids’ room, you can see photos of their family members. Joanna selected all black-and-white images for this wall, framed in a moody black that ties into the metal handrails on the staircase. 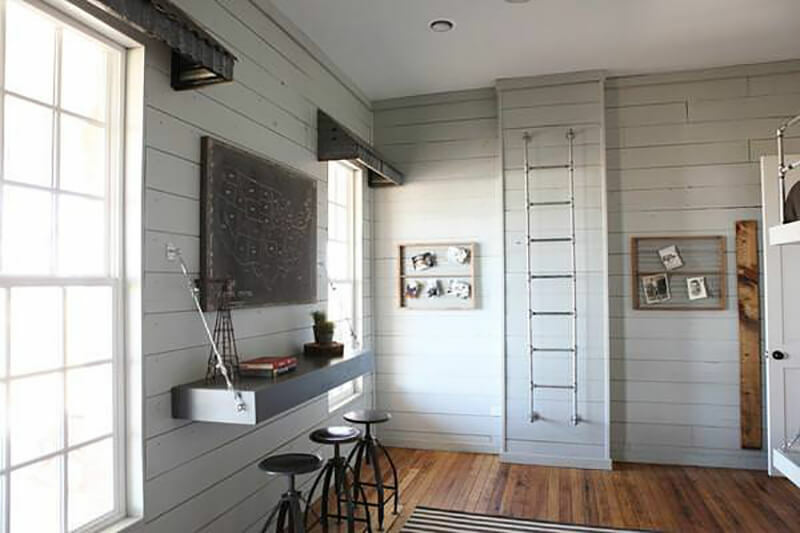 The black is softened by the white shiplap walls and stairs. See what they did with the unfinished attic, next. What to do with an unfinished attic? When Joanna took to finding a vision for this previously unoccupied space, she decided to fill it with something fun. In one of the corners, tucked alongside the brick chimney is a coffee bar. Of course, the coffeemakers are the only modern element to this cute corner. Joanna found a retro high-top dining table, and Chip mostly likely was the one to mount the reclaimed counter to the wall. You can see how she maximized the small space and made it into something fun. Also in the attic is a space for craft making. A designer herself, Joanna created a place where the kids can sit together and get creative. 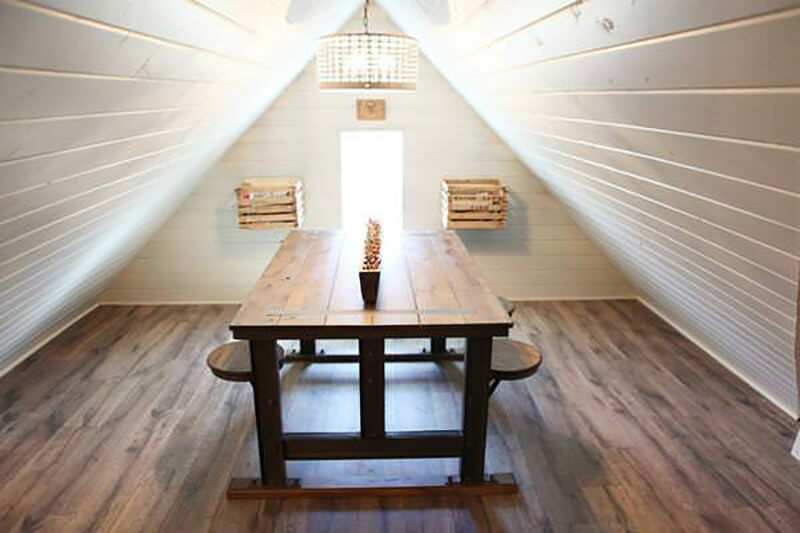 This room has a balance of white shiplap A-frame walls and warm wooden floors and table. 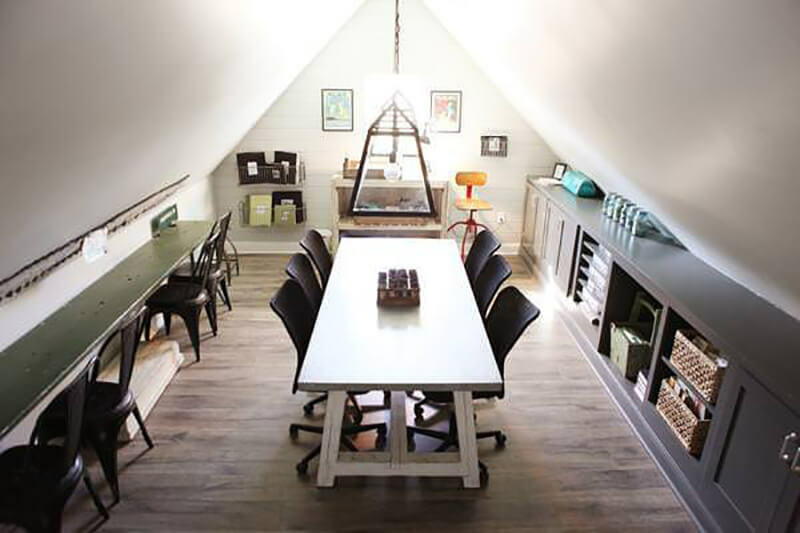 Because the attic’s ceiling is an A-frame, the use of space is limited. But Joanna found that a four-top table centered in the middle would fit just right. Painting the walls white allowed for the space to feel well-lit, even though it only has a small window. The adults get a creative space, too! Although their businesses keeps them plenty busy, Chip and Joanna have always made it a priority to spend as much time with their kids as possible. Although they have a separate office for their businesses, the Gaines’ saved a place in the farmhouse to take care of things from home, too. The design is clean and simple, which probably helps with staying focused. Whether they’re holding a meeting or taking a phone call, this room has everything the couple needs in a home office. One of the attractive parts about farm life for the Gaines was spending more time outdoors. In order to seat the entire family for a meal, Joanna made sure they have a long table with bench seats outside. The Gaines were certain that the farm life was for them. When they came across the 40-acre property nearby their businesses, they knew it was the one. The land had beautiful old oak trees, a barn, and fencing for animals. Since moving onto the farm, the family has welcomed over 60 animals! Chip is notorious for “surprising” Joanna will a new addition to the farm. They have cows, goats, horses, dogs, chickens, turkeys, pigs, and more. Maintaining a personal life while hosting a reality TV series is no easy feat. The Gaines’ HGTV series Fixer Upper has run five seasons, but they’ve stayed true to their roots. Not only has the entrepreneurial couple maintained their residency in the area they met and started their family, they chose to make a forgotten farm house from 1895 their dream home. 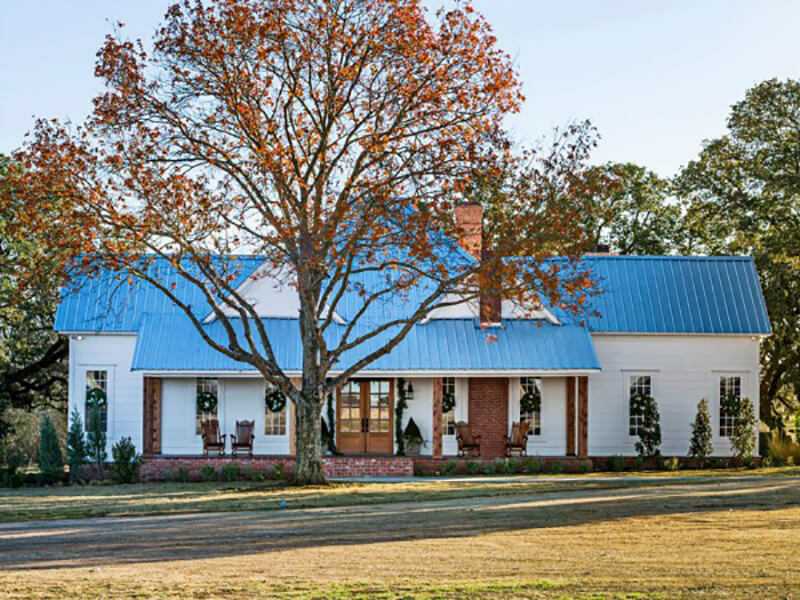 The design of Chip and Joanna’s farmhouse reflects the style she brings into their Magnolia Homes and is a true representation to Joanna’s authentic rustic farmhouse style. The Farmhouse is not only the family’s living space, it has also inspired some of Joanna’s most famous home makeovers. Let’s check out some of her most beloved before and after projects that incorporate farm living and modern design in some fun and creatives ways. On season 4, episode 7, Joanna showed off her ability to take a worn-down living space and transform it into a modern design for a married couple. Even with her modern take on the home, Joanna managed to bring in the outdoors with a storage rack for wood. Bringing in additional light with wall-to-wall windows while hiding the previously exposed beams was a departure from her traditional designs but the final result is stunning. When Joanna Gaines isn’t busily adding shiplap to homes her mission is to open up spaces, bring in natural lighting, and, of course, throw in a good amount of subway tile. In this redesign (season 4, episode 10), Joanna completely resigned a couple’s kitchen by tearing out the old kitchen, extending its size, and adding a brand new island. With plenty of natural light and more shelf space, it’s one of her most stunning kitchen reveals from the show’s run. 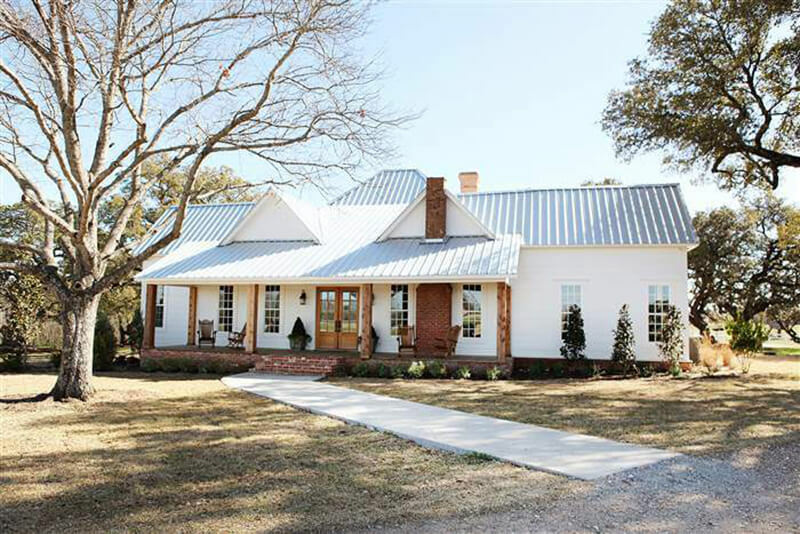 Joanna Gaines may be known for her farm style designs but her simple understated design changes are among some of the best she has completed. In season two episode seven, Joanna transformed this master suite for a college chaplain and his wife. Simply removing some bulky built-in cabinets, adding hardwood floors, choosing a stunning chandelier, and carefully placing some eye-catching furniture in the bedroom, Joanna took a drab green room and turned it into a master bedroom that is likely the envy of all this couple’s friends. 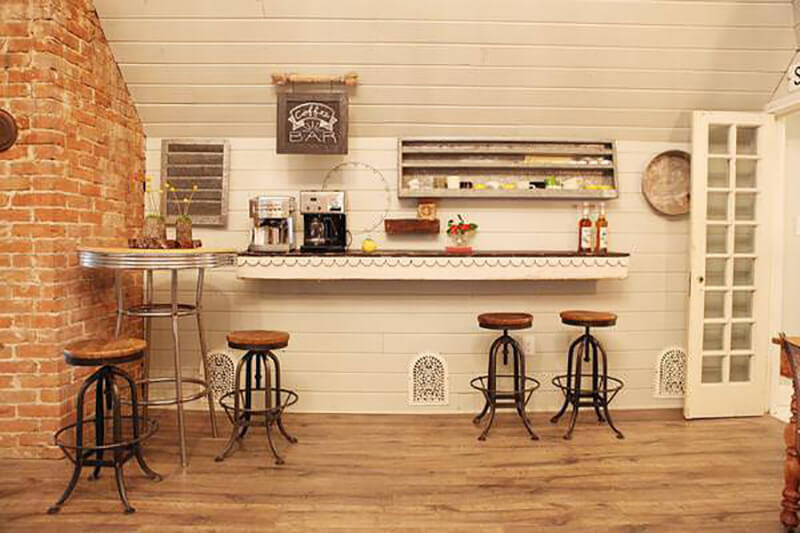 One of Joanna Gaines’ specialties is repurposing poorly designed and small spaces into something completely different. On season two, episode four, a young couple asked the Gaines’ to renovate their new home in a rush. A baby was on the way and they wanted a livable space with an office for dad. Joanna took an outdated walk-in pantry and turned it into an amazing space for dad to get his work done. By adding a window, throwing in some amazing carpet, and accenting the walls, this beautiful and highly functional space was created. It’s unrecognizable! When a couple of empty nesters asked Joanna and Chip to makeover their home in season two, episode five, they never would have imagined that their old garage would be transformed into an oasis for their many grandchildren to enjoy. 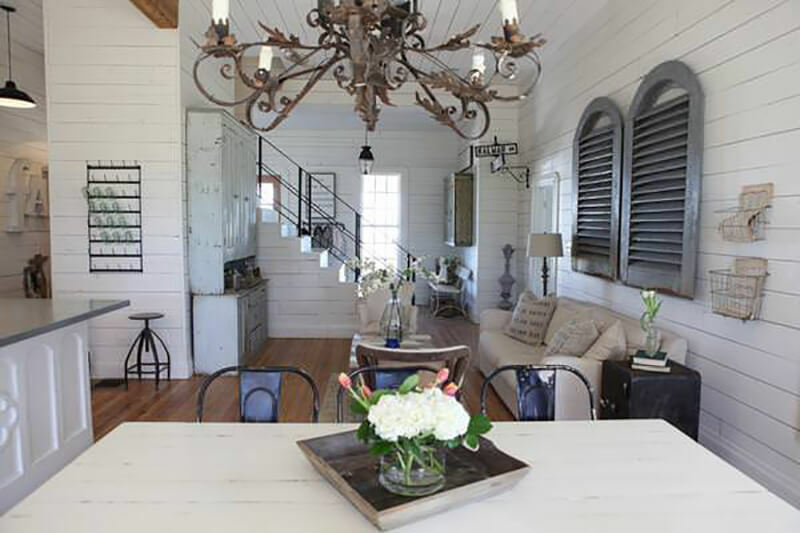 In this total overhaul, Joanna Gaines added hardwood floors, removed the garage door, replacing it with more natural lighting, and used exposed steel ladders to marry a modern design with an industrial look. Carefully curated furniture and a few simple wall accents made the space completely unrecognizable. 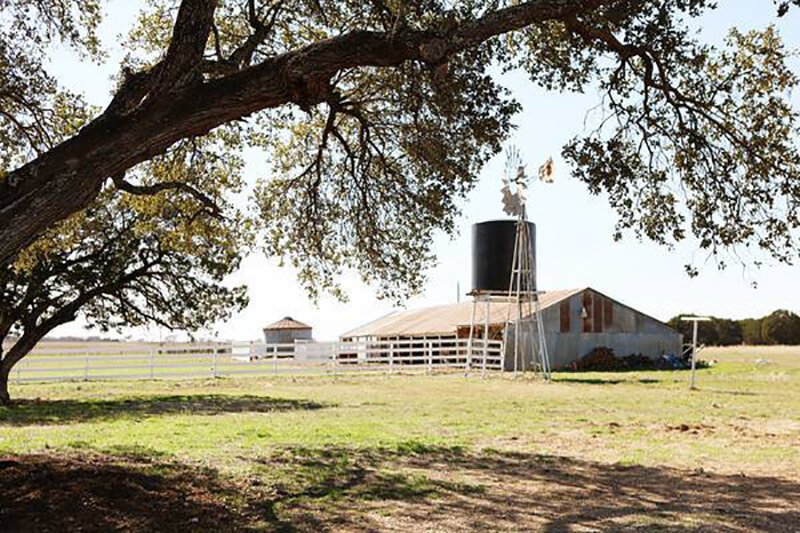 During one our favorite episodes of “Fixer Upper” a family asked Joanna and Chip Gaines to turn an old two storm barn into a home. One of their biggest requests was to create a space for entertaining during their many parties. The first floor (pictured) was transformed into a party space while the top floor was built for family living. Joanna started with a barebones space which she accented with a 17 foot long dining room table. 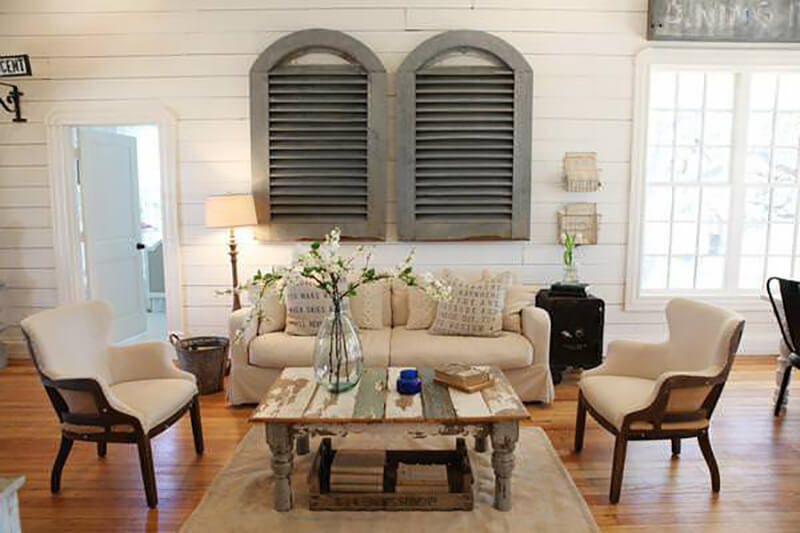 Her love of shiplap was highlighted with her expert choice in accents. Throw in some natural light by adding french doors and voila! There are many amazing examples of master bathroom designs on “Fixer Upper” but we loved the season three, episode eight, design because a small claustrophobic master bath was turned into an oasis we want to call our own. By opening up the master bath’s wall and re-organizing the space’s layout, Joanna was able to create an inviting space that looks nothing like the original. Throw in a rainfall walk-in shower, natural lighting, and an amazing choice in flooring and it’s easy to see why “Fixer Upper” was a massive hit. Look at that cabinetry! This project was special because an old dilapidated family home with many memories was turned into a stunner. The next before and after redesign features a front porch that we envy and we don’t mind admitting it. Season three, episode eight made our list twice because the old family home Chip and Joanna Gaines redesigned held so many lifetime memories for the young couple who took it over. 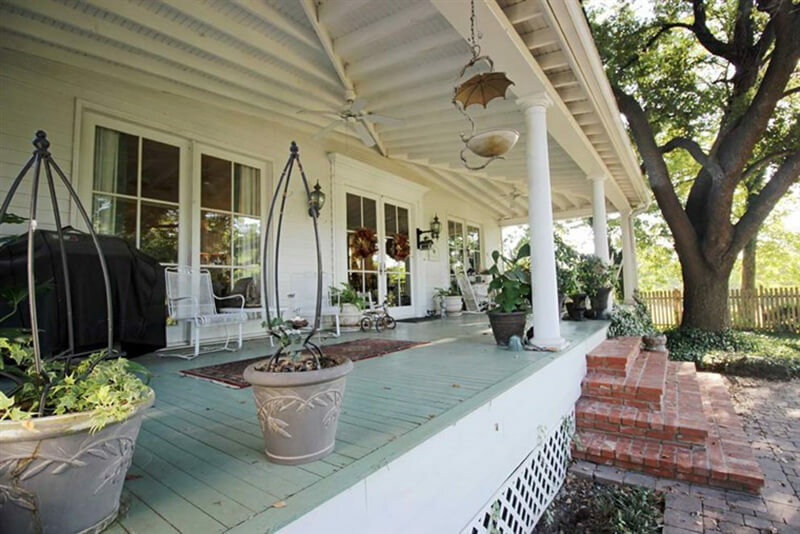 In this redesign, a new front porch highlighted the home’s country living. 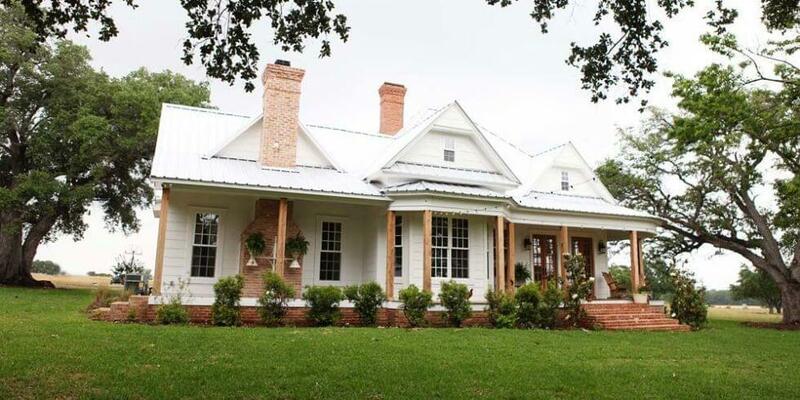 Joanna Gaines completely resigned the outside of this home by moving its entrance to the middle of the home while adding a front porch that is highlighted by beautiful wood pillars and a wood design that is accented by the home’s matching window shutters. Accented with some amazing chairs, this is our favorite porch from the series. In season 4, episode 1, Chip and Joanna tackled an outdated 1950s ranch-style home for a couple purchasing their first home together. In the dramatic transformation, the house was opened into a free-flowing plan. Here, we see the living area. The formerly tiny kitchen was opened up and a large island installed. The living room, already a nice size to begin with, received a fireplace. The raised ceilings make the entire space look that much larger. If there is something Chip and Joanna are great at, it’s surprising people. Well, in season 4, episode 8, a man named Kelvin Beachum Jr. wanted to surprise his parents with their dream home. Beachum Jr., who plays football for the Jacksonville Jaguars, worked in secret with the Gaineses to accomplish the big surprise. Needless to say, his parents were stunned when they saw the house! Here we see the kitchen and eating area, which were completely opened up and given brand-new finishes. The result is a bright, modern, and flowing space perfect for family get-togethers. He changed his tune after seeing the transformation from dowdy to sleek and contemporary. It even has covered outdoor sitting areas, perfect for living on the water. You’d barely recognize it as the same boat at all! This was such a special episode that we need to show a second, interior shot of the houseboat that appeared in season 4, episode 14. This gorgeous and contemporary houseboat is a lot more spacious on the inside. The homeowner needed the space for his family of four children! Chip and Joanna really came through for this unique renovation. They put in new floor-to-ceiling windows and opened up the dated kitchen. There’s even a bunk room big enough for all four kids and lots of outdoor spaces that the whole family can enjoy together. 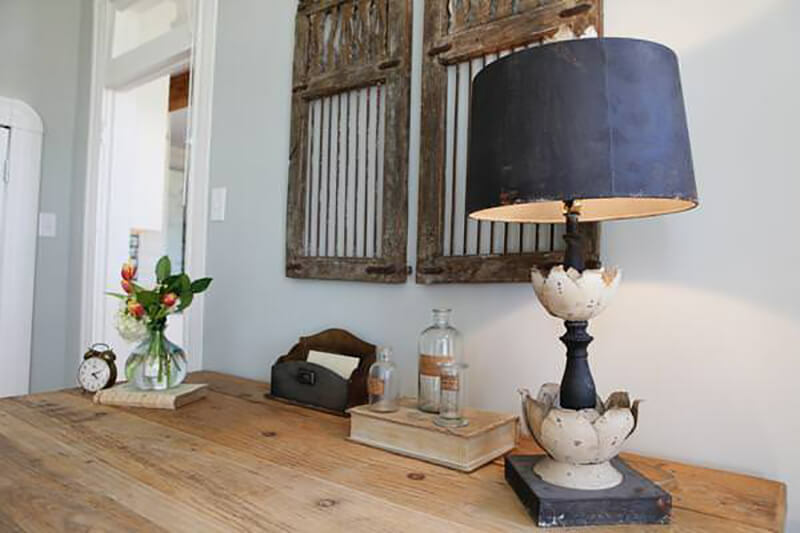 A tiny 400-square foot home got to experience the Magnolia magic in season 3, episode 15. 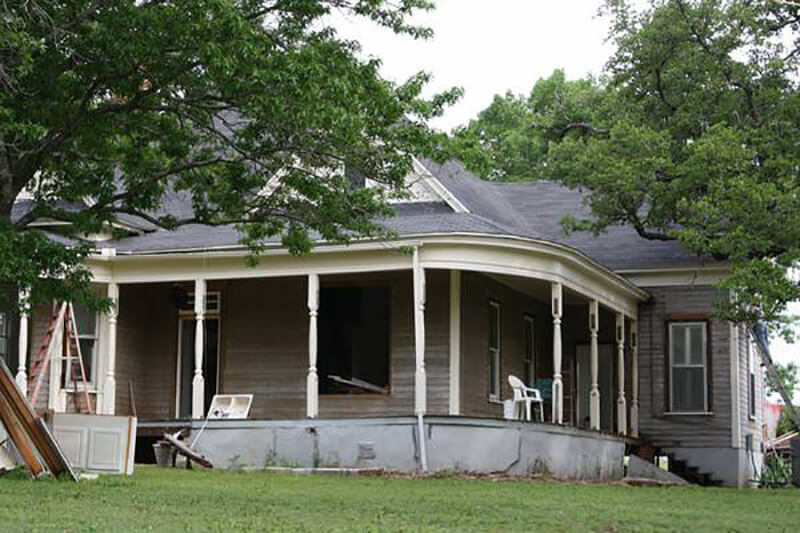 The house, one of the only original shotgun-style houses still standing in Waco, had a special historic charm that the owners wanted to preserve. As Joanna said, “what’s fun about smaller spaces is that it really challenges your creativity and makes you maximize the space that you’ve got.” Chip and Joanna nailed it with this one, making use of every square inch of the home. Here’s the home’s exterior, before and after. See an interior transformation on the next page! Some features that you’d find in a “normal” house are just not going to be realistic in a space this small. One traditional feature that Chip and Joanna decided to forgo in the shotgun home was a separate dining room. Instead, they incorporated a large island with plenty of room for seating. Here’s a before-and-after shot of the kitchen. As you can see, it was in complete disrepair before the renovations but is now a light-filled room with much more space than you’d expect in a home this size. When a Waco native who moved to New York wanted to return to his Texas roots, Chip and Joanna were there to help him find his dream bachelor pad. The 1969 lakefront ranch was dated when they located it, but a complete renovation transformed it into a modern and comfortable home in season 4, episode 8. The dramatic style in the kitchen/dining area is a good example of how the rest of this renovation turned out. The Gaineses were sure to add lots of masculine touches to this one, fitting with the homeowner’s personal style.